Click here for the Vegas "Analysis"
The fans got some action at the start of this one. Ryan Dungey and Justin Brayton charged into Sam Boyd Stadium first, but soon Eli Tomac sliced underneath Brayton to get to second, and then tripled off a dragon back to get to Dungey. They battled side by side through Monster Alley outside the stadium and the crowd went nuts! After two passes, Dungey got the lead back, but Tomac looked to be settling in for a long twenty-lap battle. Until he washed the front end. 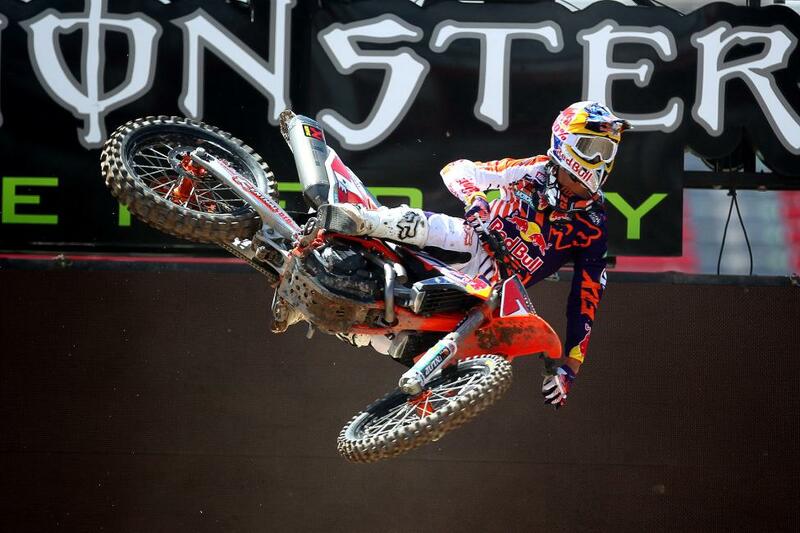 That was it, Dungey was off to the win. Well, with Cooper Webb knocked out of action via an ankle injury in practice, there wasn't much of a chance that Marvin Musquin wouldn't dominate this one. Or maybe there was no chance, because he did indeed dominate. Once the Frenchman entered the stadium in the lead, everyone knew this one was over except Malcolm Stewart, who gave him a good run for a few laps. Then Marvin pulled away and this one was over. Chalk it up for the East side. Like really East. France. Malcolm was second, leading a train of GEICO Honda riders, with RJ Hampshire and Matt Bisceglia third and fourth. Aaron Plessinger worked his way through the pack to challenge them, and then Bisceglia put a block pass on Hampshire, which slowed Hampshire up. Plessinger snuck past, but couldn't make a run on Bisceglia. That left Musquin, Stewart and Bisceglia as the top three. FIrst, the official word from Star Yamaha Team Manager Steve Lamson is that Cooper Webb, who ironically crashed in the corner they later removed, is out for tonight. He didn't return for the timed sessions. Ouch, the Shootout just lost a lot of luster. This makes Marvin Musquin the odds-on favorite for tonight's Shootout, especially with his east challengers like Justin Bogle and Jeremy Martin also out. But Vegas loves an upset, and perhaps it could come from Malcolm Stewart, who was fastest of the West qualifying and closest to Marvin on times. His lap with three tenths off. If something crazy happens, maybe Mookie? Maybe McElrath? Hill? 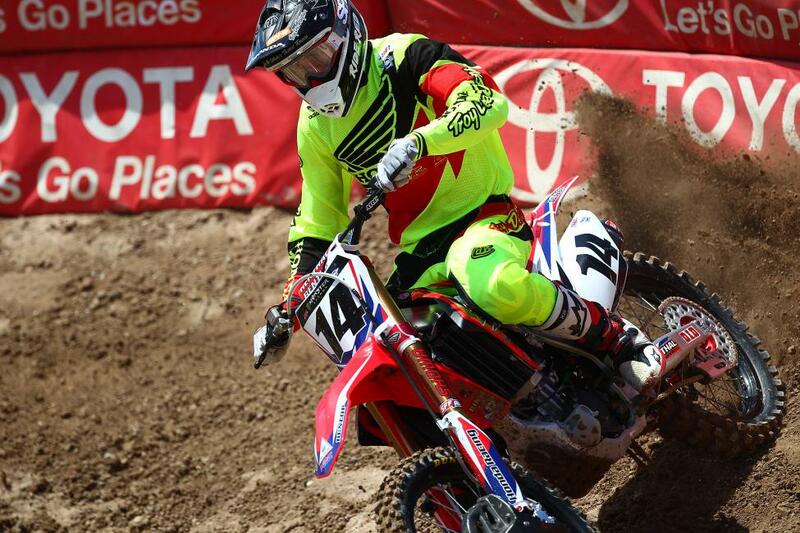 Yeah, remember he was super fast here at the Monster Energy Cup. Maybe Savatgy from the east? Also, some history made here already as Vicky Golden was 35th and has qualified for the night show. We believe that's the first female racer every to do so. There were 41 total riders in qualifying so it's not like she just lucked into it, she outpaced six riders to make it happen. The first untimed session--which is actually timed but doesn't count for qualifying--proved this extra long track was actually too extra long. The fastest riders were clocking 1:14 lap times, and that will make for a very long TV show tonight when you consider that's a good 25 seconds longer than most SX tracks. So before the timed sessions began, a corner was eliminated, and that cut the times down to the 1:10 area, which will save a lot of time when you multiply it to the amount of laps they'll run tonight. We know, we know, you want longer laps and more racing, but we don't think you'll miss four seconds a lap, or the one little corner they took out. Copper Webb had a crash. After last night's dramatic AMSOIL Arenacross final, where Jacob Hayes and Kyle Regal were tied for the points lead and saw the season decided on the mother of all block passes, the mood is notably tamer here for the Monster Energy Supercross finals at Sam Boyd Stadium. All the title are locked up, with Ryan Dungey claiming the big crown on his Red Bull KTM, and Cooper Webb (Yamalube/Star Racing Yamaha) and Marvin Musquin (Red Bull KTM) claiming the West and East 250SX Titles, respectively. But we're okay here even without the championship drama, because the Vegas race is as much a party and celebration of the season as it is just another race. The pits here are much larger and more opulent than any other race, and there's even an entire section devoted to activities like car drifting, freestyle and whatever other shenanigans Monster Energy found while going back down to the lab. And don't forget tonight's Dave Coombs Sr. East/West Shootout, where Webb, Musquin and the rest of the top 250 riders will square off. The track is bigger and crazier, too, lap times are well over a minute because the track, as always, winds its way outside the stadium in the high speed Monster Alley. Also, the Vegas track is always over watered, too, because the hot (very, very hot) sun will bake it all day. So in practice right now, it's super sloppy and dudes are casing jumps all over the place. We also saw Cooper Webb go down in the first 250 West practice and get up slowly--we'll check on his status as the first timed practices begin.